SS Electric Contact Gauge is exported and supplied by us from Singapore. 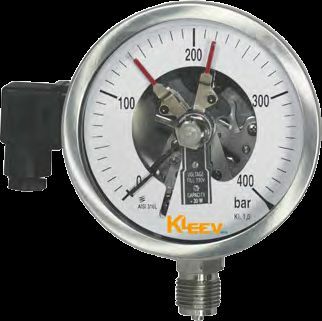 SS electric contact switching controls gauge comes from KPG-28 series. Its nominal size is 100/150 mm and its wetted parts are AISI 316L stainless steel. Its accuracy is ±1.0% F. S and its range is up to 1600 bar. It comes with both the options of dry / liquid filled execution.